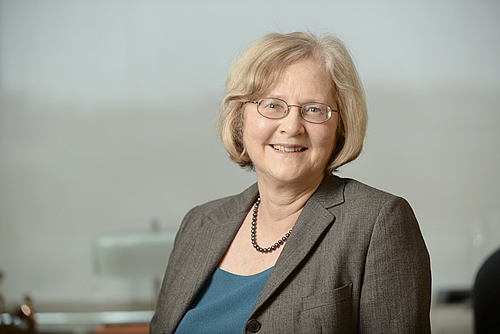 LA JOLLA—Nobel Prize-winning scientist Elizabeth Blackburn, a pioneering molecular biologist and highly respected leader in the scientific community, has been named president of the Salk Institute for Biological Studies. Blackburn will join the Salk Institute from the University of California, San Francisco (UCSF), where she is a professor in the Department of Biochemistry and Biophysics. She will assume her new role effective January 1, 2016. As Salk’s president, Blackburn will take the helm of the Institute’s world-renowned scientific enterprise, leading a cadre of scientists as they push the frontiers of discovery in fields such as cancer, neuroscience, aging and plant biology. Blackburn won the Nobel Prize in Physiology or Medicine in 2009 for discovering the molecular nature of telomeres, the ends of chromosomes that serve as protective caps essential for preserving genetic information, and for co-discovering telomerase, an enzyme that maintains telomere ends. Both telomeres and telomerase are thought to play central roles in aging and diseases such as cancer, and her work helped launch entire new fields of research in these areas. In addition to the Nobel Prize, Blackburn has received nearly every major award in science, including the Lasker, Gruber and Gairdner prizes. She was named to the TIME 100 in 2007, the magazine’s yearly list of the most influential people in the world. She is a member of numerous prestigious scientific societies, including the National Academy of Sciences, the National Academy of Medicine and the Royal Society of London. Blackburn has shown an abiding commitment to public service in the scientific, academic and public policy arenas. She has served as president of both the American Association of Cancer Research and the American Society for Cell Biology, and has served on the editorial boards of several scientific journals, including the influential journals Cell and Science. Helping to guide public science policy, she was a member of the Stem Cell Research Advisory Panel for the California State Legislature and a member of the President’s Council of Bioethics, an advisory committee to the President of the United States. Blackburn’s tenure as Salk’s president will begin on January 1, 2016. However, she is no stranger to the Institute. Since 2001, she has served as a Salk nonresident fellow, one of a group of leading scientists that advise the Institute’s leadership and play key decision-making roles in the appointment and promotion of Salk professors. “I am truly honored to be asked to be the next president of the Salk Institute. The Salk is full of absolutely terrific people and brimming with great science. Building on its distinguished history and current success, I am delighted to be playing a role in continuing and growing its major contributions to science and health research,” says Blackburn. Blackburn was born in the small city of Hobart in Tasmania, Australia, to a family of doctors and scientists. Her parents were both family physicians and her grandfather and great-grandfather were geologists. Inspired by her fascination with animals and a biography of the iconic French scientist Marie Curie, Blackburn chose to also pursue a career in science. She earned her bachelor’s and master’s degrees in biochemistry from the University of Melbourne, and received her doctorate in molecular biology from the University of Cambridge in England in 1975. She conducted postdoctoral research at Yale University from 1975 to 1977. Blackburn joined the faculty of the University of California, Berkeley in 1978. She moved to the University of California, San Francisco in 1990 and chaired the Department of Microbiology and Immunology from 1993 to 1999.